A grassroots protest movement in France has ballooned and radicalized, unleashing anger that devastated the heart of Paris in weekend riots and revealed a fracture in the country between the haves and have-nots. Tough talk by unpopular President Emmanuel Macron, who has been roundly blamed for the chaos, isn't likely to mend the growing sense of social injustice. Discontent about the rising cost of living among the "little people," as many protesters call themselves, had been growing, along with a sense of marginalization. The approach of Macron's fuel tax increases in January, meant to wean the French off fossil fuels, has caused things to snap. The weekend violence in Paris, in which more than 130 people were injured and over 400 were arrested, was the worst in the country in decades, officials have said. The protesters say they want to level a playing field that they believe is tipped in favor of the elite and well-off city dwellers. 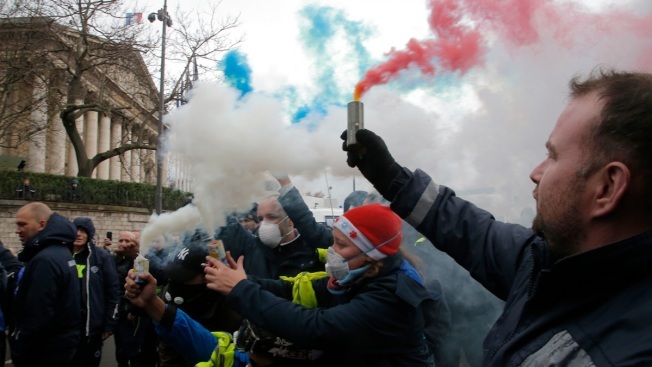 The fuel tax "was the spark," said Thierry Paul Valette, a Paris protest coordinator, in an interview. "If it hadn't been (that), it would have been something else." "People want fair fiscal justice. They want social justice," he added, as well as improved purchasing power. Members of the nationwide movement call themselves the "yellow vests," after the fluorescent safety clothing that all French motorists are obliged to keep in their cars. "It's clear the position of President Emmanuel Macron is untenable ... contempt for a France that suffers and contempt for a France that's not doing well," Valette said. The Yellow Vest movement has no leaders but is trying to organize and choose legitimate representatives to negotiate with the government. An attempt to meet last week with Prime Minister Edouard Philippe failed. Reports that another rendezvous announced for Tuesday was canceled by the protesters could not be immediately confirmed. The movement, which organized on social media in October, was initially made up of retirees, the self-employed, artisans and others having a hard time making ends meet, often from rural France and in their 30s and 40s, said Sorbonne sociologist Jean-Francois Amadieu, an expert in social movements. As the government braces for a fourth weekend of protests, discontent spread Monday to ambulance workers and some high schools with students upset about scholastic reforms. That's a danger sign, according to Amadieu, who believes the protests could have been nipped in the bud weeks ago. He said the 40-year-old Macron, who is surrounded by a young team with little experience, misread the signs of the extent of discontent and failed to understand that refusing to budge on a policy isn't always the best route to take in France. "These are people who think you govern a nation like a startup," Amadieu said. Macron, whose popularity is plummeting, is also widely seen as arrogant with a style that ruffles sensitivities, such as telling an unemployed man he can find a job if he "crosses the street," or advising a retiree not to complain. "Never has a president communicated like that," Amadieu said. The protesters have positioned themselves at strategic roadways, filtering traffic to a slowdown in the protests that began Nov. 17. Three people have died since then, although none in Paris. Valette blamed the past two weekends of violence on people "usurping the yellow vest." On Saturday, shops were looted and cars torched in plush neighborhoods around the famed Champs-Elysees Avenue. The Arc de Triomphe, which cradles the Tomb of the Unknown Soldier and was visited by world leaders last month to mark the centenary of the end of World War I, was besmirched with graffiti and vandalized inside. A 19th century statue was broken. "The yellow vests will triumph," one scrawled slogan said. Amadieu said the violence is seen by many as a necessary means for change. "We all learned about the taking of the Bastille and the French Revolution. ... Change is always through a rapport of force," he said. "That is, unfortunately, very anchored in France." Some graffiti on the Arc de Triomphe showed that the ultra-right and ultra-left had melded into the movement. But violence already was bubbling up from within. Jason Herbert, a Yellow Vest representative who met briefly Friday with the prime minister, said he and others who bowed out had received threats from fellow demonstrators, and he said the movement was radicalizing. "We have all received enormous pressure ... threats, be they verbal or physical," Herbert said. "Our lives are still at stake." He described those making the threats as people who are "terribly hopeless, terribly miserable, (who) lost everything (because) everything was taken from them." Paul Marra, a Yellow Vest in the southern Bouche-du-Rhone around Marseille, warned over the weekend that time is of the essence to end the crisis. "The longer the executive office waits, the more complicated things will become," he told the broadcaster BFMTV. He said there would be an "Act 4, Act 5, Act 6," referring to the Saturday protests. "Today things have gone too far," he added. Jeffrey Schaeffer and Sam Petrequin contributed.